No-bake cheesecake bars! Yes, you read that right. 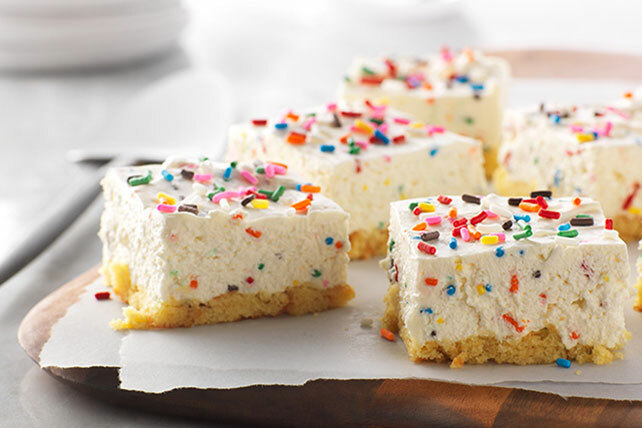 Our Birthday Cake No-Bake Cheesecake Bars take just 15 minutes to prepare, no baking required. Line 9-inch square pan with foil, with ends of foil extending over sides. Crumble cupcakes finely into prepared pan. Use moistened fingers to lightly press cupcake crumbs into even layer on bottom of pan. Beat cream cheese and butter in medium bowl with mixer until creamy. Add sugar and vanilla; mix well. Gently stir in COOL WHIP and 6 Tbsp. sprinkles; spread over crust. Top with remaining sprinkles. Refrigerate 4 hours or until firm. Use foil handles to lift cheesecake from pan before cutting into bars. Prepare using PHILADELPHIA Neufchatel Cheese and COOL WHIP LITE Whipped Topping.